Let’s face it, no one likes to deal with the back-breaking labor of painting anything by hand. Whether it’s adding an accent wall to your living room with rollers or re-staining your cabinets with a brush, the whole process can be very messy and very time consuming. Unless you have a paint sprayer. Paint sprayers can save you countless hours of effort, while also allowing you to achieve the smoothest, most consistent coatings possible. But the question is, how do you choose one? I faced that very same question, and ran into a lot of snags along the way. That’s where Paint Smoothly comes in. 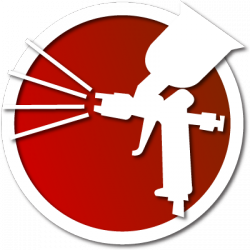 I’ve got reviews, buying guides, in-depth articles, and more to help you find the absolute best paint sprayer for any situation. So what are you waiting for? Let’s find you a new paint sprayer! Deciding to take on any kind of paint project can be daunting, especially if you’re using a highly complicated paint sprayer and have little to no prior experience. All of the beginner painters out there will love the way this paint sprayer is built to be direct and easy to operate, focusing on simplicity to make this a great entry point tool. One of the reasons this is an amazing paint sprayer for beginners is that it does not require an external air compressor, which means you’re already removing one of the most complicated (and potentially dangerous) aspects of paint spraying. Here, all you have to do is fill the included paint cup, attach it to the base sprayer and plug the whole unit into a standard wall outlet. Its internal motor creates the air pressure necessary to spay the paint, so you won’t need any additional components. In case you thought that this beginner’s model would only include the bare bones features, you’ll be pleased to learn that it actually offers you quite a bit. First off, you have an amazing nozzle that you can adjust to achieve three different spay patterns – circular, vertical, and horizontal. Now, combine this with the brass housings and the precision controls, and you’re actually going to be able to cover a huge variety of surfaces with much more accuracy than other models. One of the first things you’re going to discover about painting is that you’re almost always going to be working both indoors and outdoors, and that each setting carries different requirements. This paint sprayer from Wagner includes a ton of great features that make it the ideal choice for both indoor and outdoor painting. This is the type of paint sprayer that you would want to have on hand if you find that you need to move between the inside and outside of a location, such as spraying the walls of a room as well as the railing of a balcony. Indoor painting requires you to have a low release of excess paint, as it could cause an inhalation risk or leave paint splatter on the surrounding area, while an outdoor sprayer needs a certain amount of power to handle operation in those settings. This model manages to give you both, so that you can work in either indoor or outdoor locations without worry. Balancing the power and intensity of the spray stream is key when you’re working on most jobs, since you always want to match the flow to the size and shape of your work area. You can achieve this kind of dynamic operation here thanks to a variable trigger, which allows you to spray in patterns ranging from ½ inch on the low end to an impressive 9 inches on the wide end. With this kind of flexibility, you can easily transition from the needs of an interior or exterior paint job without having to swap out for different attachments or nozzles. Whether you’re dealing with a self-contained unit or a sprayer that attaches to an external compressor, you’re always going to run into limitations and restrictions on the types of paints and compounds you can use with the unit. If you want to be able to spray a huge variety of paints and other materials, such as stains and finishes, then the Graco Magnum is the sprayer for you. The majority of standard paint sprayers are only going to be compatible with standard types of house paints, and even then you might experience additional limitations in terms of viscosity. Here, you can work with an impressive array of compounds, including heavy latex paints, acrylics, wood stains, and more. With that kind of versatility, you can trust that this sprayer will be able to handle a very wide assortment of projects, making it a great choice when you need to work with different wood types or other surfaces around the house. This model has its own internal compressor, so you won’t need to connect it to an external air supply. That makes it a smart choice for use around the home, since you won’t have to store or operate any additional machinery or tools to get the job done. 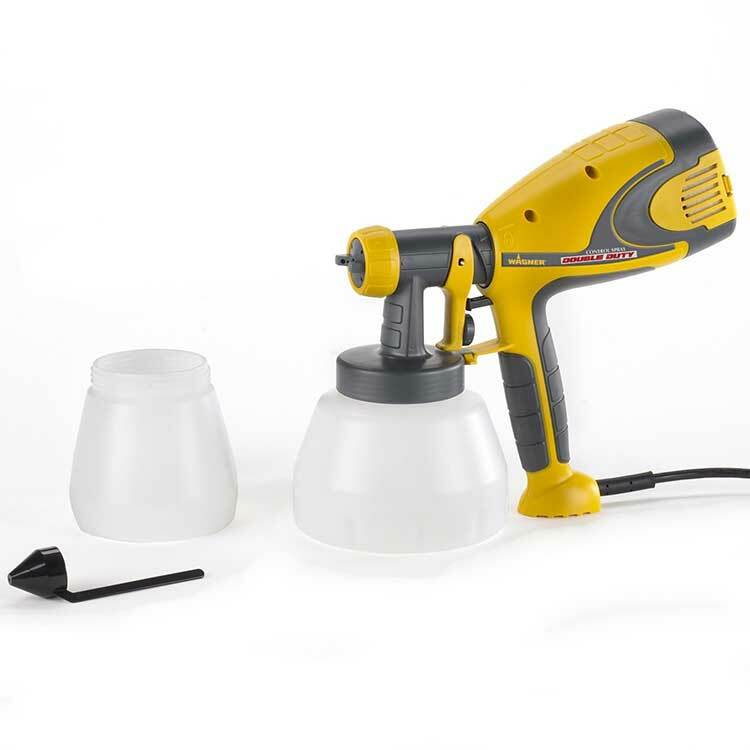 However, unlike other airless paint sprayers, this model doesn’t require you to fill up a cup with paint. Instead, it connects directly to the paint can and feeds the paint through a 25 foot hose. This allows you to save time on your projects, since you can move more freely and won’t need to keep refilling a small cup all the time. Calling a paint sprayer “portable” is pretty different from most other types of power tools, since you can’t really bring it anywhere like you could with a cordless drill or a battery-powered reciprocating saw. However, when you need to move a lot for a painting job, I would definitely recommend you try out this great model, which gives you the ability to move and paint with minimal interruptions. Like I said, you can’t really achieve full portability with painting unless you use a brush or a spray can, since you’re always going to need a power source to atomize the paint. This paint sprayer was made with that concept in mind, and focuses on minimizing these limitations to give you as much room to move as possible. The base is compact and comes with an easy carrying handle and long power cord. You also have a 20-foot flexible air hose, so you can move around quite a bit during the actual painting process. Just because this paint sprayer allows you to move around while working doesn’t mean that it shorts you on any of the key features you would want to have. It’s capable of working with latex based paints, as well as a good number of other compounds. It also comes with a viscosity cup, which allows you to measure how thick or thin a material is so you can make sure it’s the right consistency for optimal spraying. I also really like that it comes with a cleaning brush, so you can keep it running smoothly. 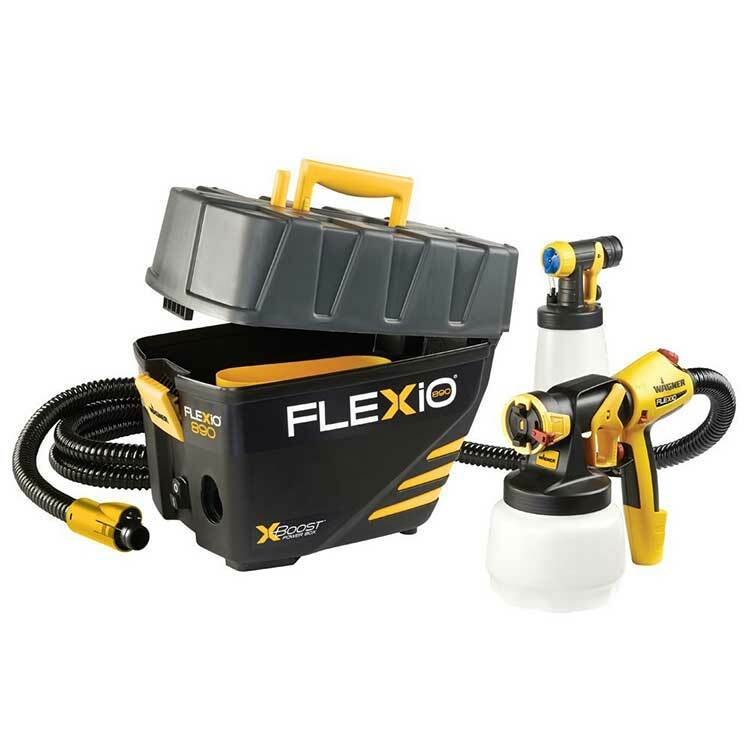 If you’re looking for a fully equipped starter kit to get you up and running with an airless paint sprayer, then look no further than the Flexio 590. It includes all the cups and components you need to start painting right away, as well as an additional detailing nozzle and a helpful carrying case. Nothing is more disappointing that purchasing a piece of equipment for a project, only to find out that you need additional components or tools to really get it going. Well, you won’t have to worry about that with this kit, because it’s got everything you’re going to need to get the sprayer fully operational. You can fill up the cup with your paint of choice, plug the base in and start spraying. Since this sprayer also uses the powerful X-Boost turbine technology, you can even work with unthinned residential paint, to help you get painting even faster. This was one of the features that impressed me the most about this kit, since the majority of the sprayers out there only give you a single nozzle. The standard iSpray nozzle has an amazing range, allowing you to work with a width of 2 inches all the way up to an impressive 14 inches, meaning that you can work on interior walls or large pieces of furniture by simply moving the spray width dial on the tip. When it’s time to work on the fine details of items such as corners or cabinetry, you can switch to the detailer nozzle, which gives you a fine stream for ultimate control and coverage. 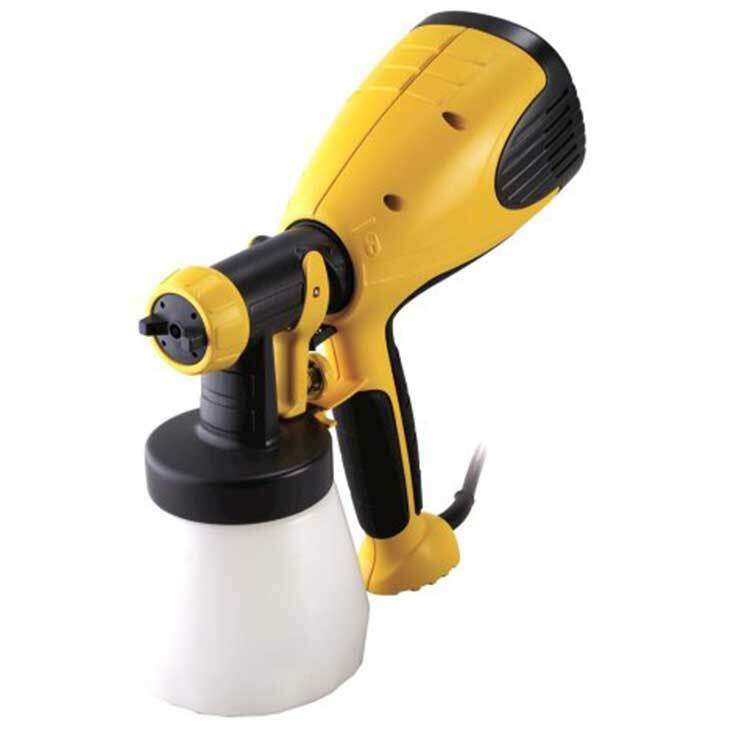 Paint sprayers all make use of different methods for pushing the paint out of the nozzle, with many relying on a type of suction system to feed the paint. When working with air compressor paint sprayers, some models let gravity do all the hard work. This is definitely one of the best gravity feed paint sprayers I’ve seen, as it offers a lot without getting in the way of the actual painting process. 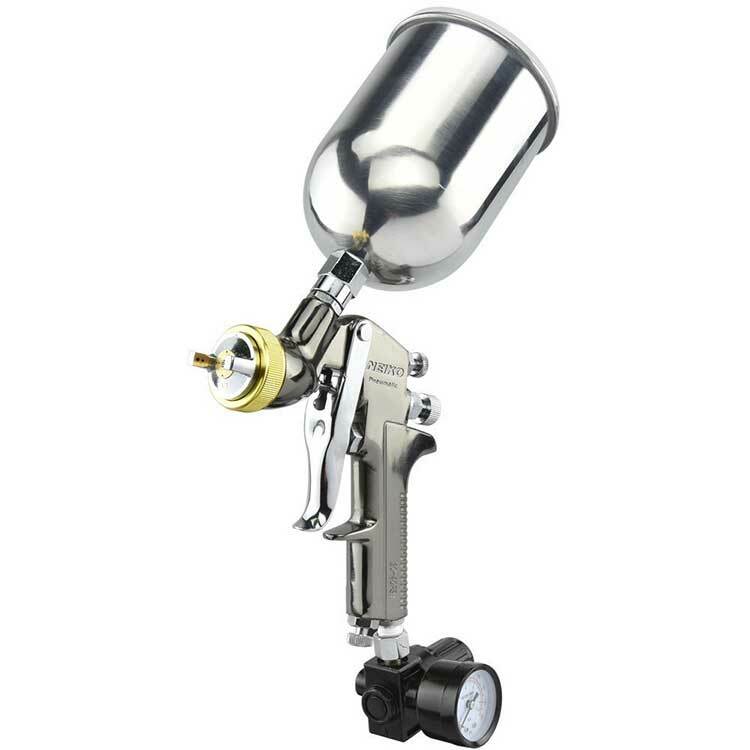 With air spray paint sprayers, an air compressor shoots a highly pressurized stream of air through the gun that intermingles with the paint to atomize it, allowing you to perform the actual painting and achieve a smooth coat. Here, the paint is stored in a cup that sits on top of the gun, allowing gravity to keep the paint flowing into the spray chamber where it can be atomized. This process means there are no mechanisms in the gun to pull the paint up, as is the case with airless sprayers, meaning that you get more efficiency and control over the entire spraying process. I was very pleased to learn that this sprayer is made out of stainless steel, which is a rust resistant metal that is perfect for this type of tool. Since it’s going to be holding a wide variety of liquids, there’s an increased chance of residue build up that could damage the body. Also, any water that is left after a cleaning could easily cause rusting that would render the sprayer useless. Stainless steel is also very strong, so it can withstand the high pressures necessary to complete the actual spraying process. 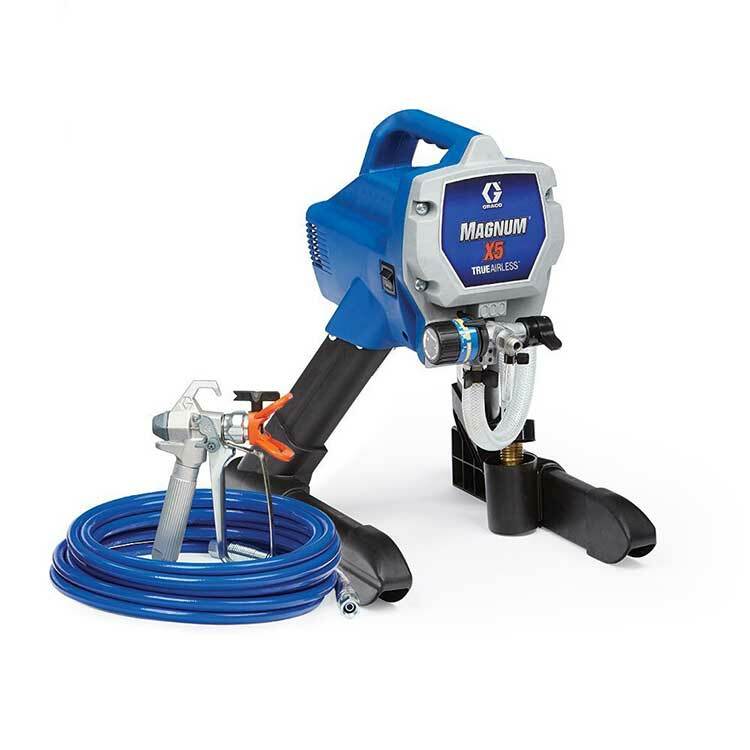 Those of you looking for a feature-rich paint sprayer that’s built with professional use in mind should definitely check out the Graco Magnum X7, because it’s got everything a small paint business could need to get virtually any type of job done quickly and efficiently. Anyone who operates a painting business, or any type of business, really, knows that it’s incredibly important to work efficiently, since time really is money when you’re running the company. 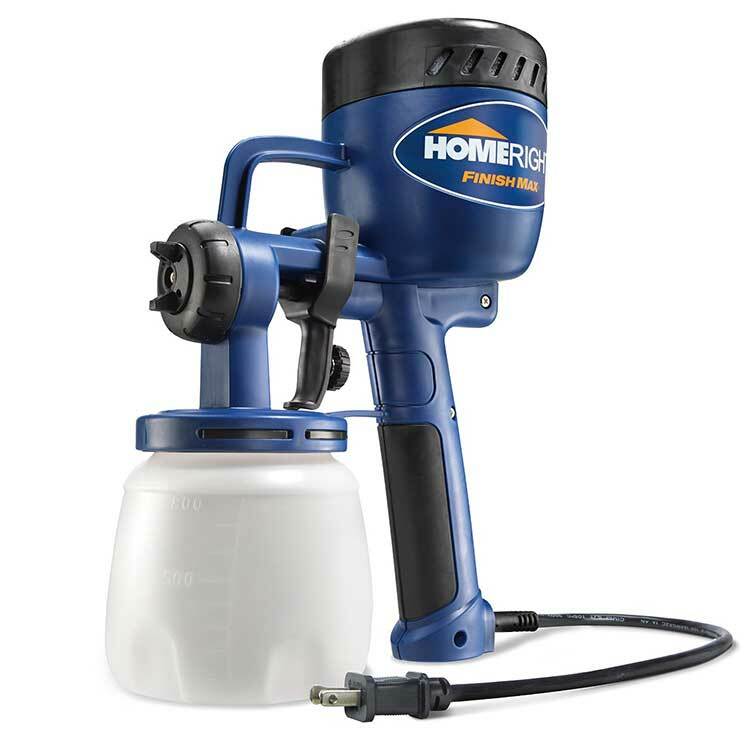 This paint sprayer is made to speed up work time drastically, through features like the extra-long connection hose that gives you more reach, or the larger spray head for wider fanning. It’s also powerful enough to work with heavier paint types, while still being easy to move. In fact, it comes with its own carrying cart, so you can wheel it around a job site for even easier mobility. Cleaning up after a job is also extremely important for a painting business, as you need to ensure that you don’t make the work site messy or dirty, and that you keep your equipment in the best shape for maximum effectiveness. 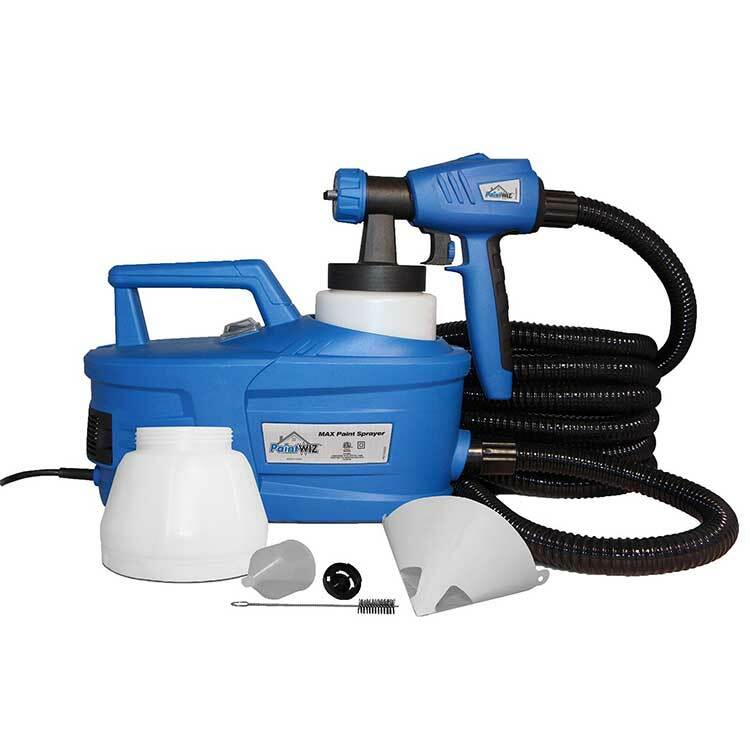 Unlike other paint sprayers, which can be very hard to clean, this model features the Graco Power Flush system for fast and efficient cleaning. All you have to do is connect a standard garden hose to the unit, and the water will flush everything out to get it nice and clean. Once you start to move into the world of air-powered paint sprayers, you open yourself up to so many different tools with different features and benefits. This model allows you to work with a bit of old-fashioned flair, since it uses a mason jar instead of a plastic cup, while also giving you more functionality geared towards some specialty jobs and needs. Most types of paint sprayers require you to house the paint, or other compound, in a cup that is attached directly to the main sprayer gun, with most cups being made of some type of plastic. With this model, the plastic cup is dropped in favor or a glass mason jar, which is sturdier and able to store a wide range of compounds without fear of damaging the cup or experiencing contact contamination due to residual residue on the cup interior. 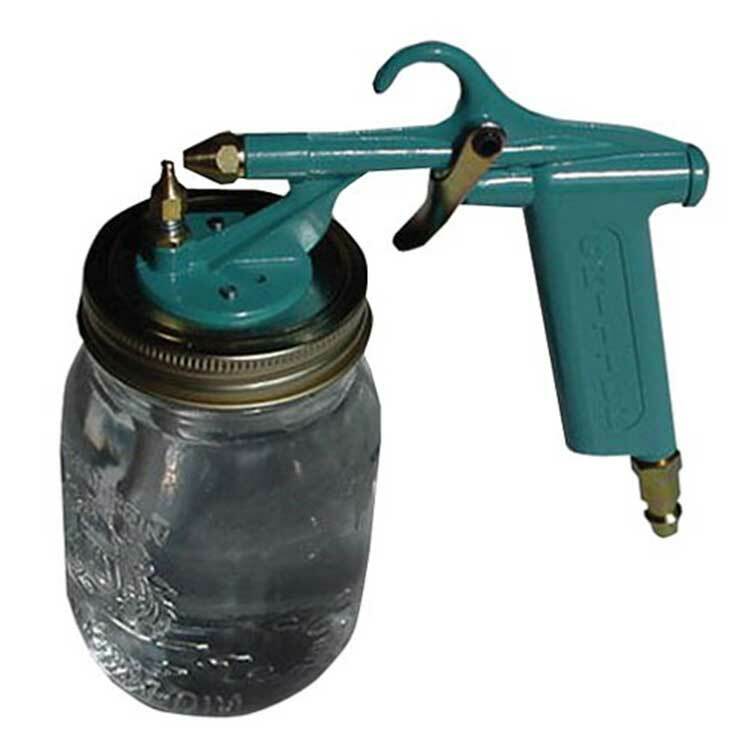 The gun is also specially designed to work with any mason jar through a suction seal system. This type of paint sprayer is a great choice for working on carpentry or woodworking projects, since it allows you to work with varnishes and other types of stains, enabling you to apply beautiful and rich finishes to your creations. Also, the fact that it uses a glass jar and a relatively straightforward gun means that cleanup is drastically easier than other models. You don’t have to worry about damaging the cup with hot water or special chemical solvents, so you can get a lot of use out of the sprayer as well. One common issue that can arise with paint sprayers is mobility and weight, since some models can be very heavy or limit your ability to move around a space. This HVLP (which stands for high volume, low pressure) system gives you more control and freedom by collecting all the components into a self-contained system. Like other models in the Wagner line, this unit features a special turbine design that was created to offer more power for larger jobs, as well as a control system so that you can dial the force down when you want to work on finer details and precision spraying. The result is a tool that drastically reduces overspray so you won’t be wasting a ton of paint through uncontrollable splatter, by finding the ideal balance between spray speed and internal pressure. It also works to eliminate sputtering, which would cause clumps of paint to shoot out and create an uneven, unsightly finish on your projects. The true beauty of this system is the fact that the internal compressor is not only completely separate from the sprayer gun, but that the compressor box has a helpful carrying handle. This means that you can move the unit in any location you desire, then leave it in one spot while you move to complete the painting without that heavy hindrance. This is all possible thanks to the nearly 12-foot long air hose, which is what connects the force of the air to the actual sprayer. Even though paint sprayers have made taking larger painting projects into your own hands much easier, some models can still be very expensive. Not everyone can justify purchasing a paint sprayer, especially when you only plan to use it sparingly. 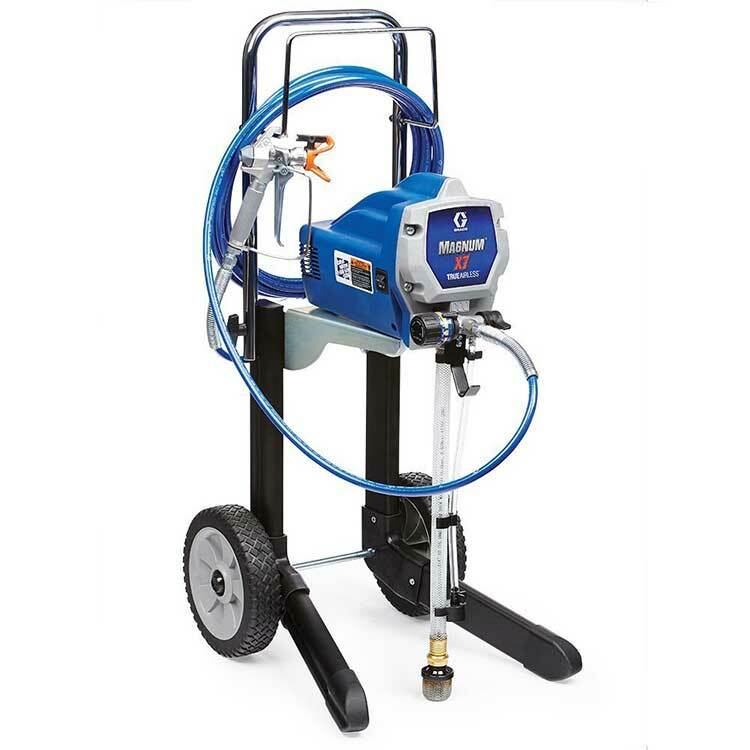 When you’ve got your eye on finances, you’re going to want a quality budget paint sprayer, like this amazing model from the pros at Wagner. A lot of budget-level paint sprayers leave you without any real controls or dynamic functionality, so you’re basically working with an electric version of a can of spray paint. That is definitely not the case with this model, as you retain access to a three-position adjustable spray tip. Being able to change the shape of spray stream is an essential part of what makes paint sprayers such a useful tool, since it means you can work with surfaces of different sizes and shapes without having to contort your arm into odd angles. Being able to have that kind of control on a budget model really helps to make you feel confident about the purchase, and the functionality you are paying for. Generally speaking, a lot of budget level tools and appliances end up being much lighter than more expensive models, as most manufacturers use low quality materials in the build in order to shave down the cost. That can make the tools weak and more prone to breaking, but here you actually get the best of both worlds. The overall weight of this sprayer is still very low, making it easy to handle and operate, but Wagner built it to still be sturdy and dependable, so you can put it through a good amount of use without having to worry about it breaking down on you. One of the best things about living in this day and age is that’s is unbelievably easy to take on do-it-yourself projects around the house, without having to make a huge investment of your time or money. When you plan to do a lot of painting work, either for home improvement or crafts projects, and are serious about the whole situation, this paint sprayer stands out as an amazing DIYer choice. 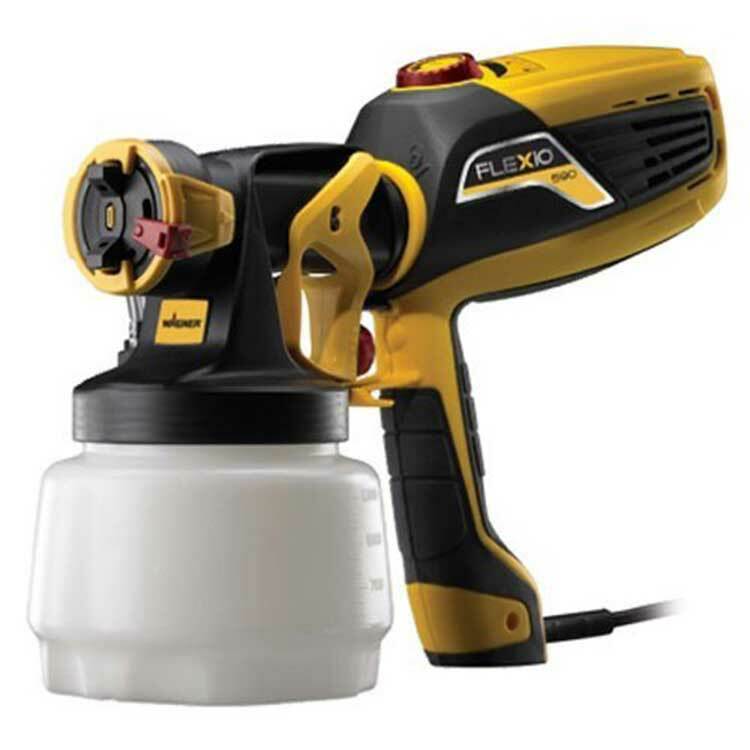 If you know that you’re going to be doing painting or staining on a regular basis, then this is definitely a great model because it strikes a wonderful balance between the hobbyist and commercial sprayers out there. You can work with a good variety of materials, so you can spray latex and oil paints or lacquers and urethanes, meaning you can complete a lot of different projects all with the same tool. It’s also transportable and easy to set up, with simple controls to allow you to change spray settings or spray width. Another key requirement for a great paint sprayer for DIY projects is the ability to store it safely away when not in use. Most people won’t have a ton of space to store a massive paint sprayer or extra air compressor, along with a ton of hoses and accessories. With this model, you can store the spray gun, the air hose, and the power cord all inside the base unit, so everything always stays together and you never have to worry about losing an integral part between uses. Paint sprayers aren’t just used for sprucing up the look of a bedroom or upcycling old lawn furniture into a shabby chic décor piece. They’re also the best way to paint a car or other type of vehicle. Automotive painting carries a whole different set of requirements and considerations from home painting, and this set really hits it out of the park on all of those fronts. Instead of just giving you one gun, which would limit the types of painting you would be able to perform, you actually get three separate guns that all easily attach to an external air compressor. Automotive painting is best done with a compressor, as it allows you to properly handle automotive paint and other materials. With these guns, you can lay down primer, spray your color of choice, apply a top coat, and even perform quick touch ups or precision work. As if the three distinct and powerful spray guns weren’t enough already, this set also gives you a lot of valuable and useful accessories to make your automotive spray painting go as smoothly as possible. First there’s an inline moisture filter to help prevent backup complications, then a locking air pressure regulator that allows you to keep track of the pressure feeding to the gun. Pressure is key if you want to achieve a smooth, even coat, free of splatter and sputters. The best part, though, is the maintenance kit, which comes with a spanner and hex wrench for disassembling the guns and attaching them to your compressor. Finally, the kit comes with brushes and filters, so you can keep your spray guns in tip top shape and extend the lifespan of their usefulness. Switching from an airless to an air spray paint sprayer gives you a lot of new advantages and access to a different set of functionality, however the total cost can still be very high when it all comes down to it. 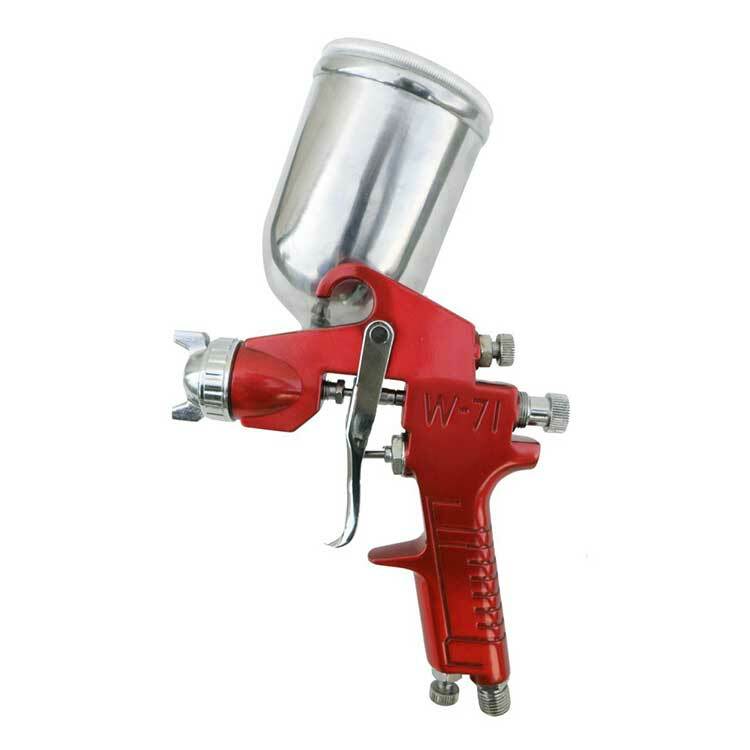 Those of you that want or need to work with an air spray paint system, but don’t want to spend a fortune in the process, should check out this affordable and impressive gun from Sprayit. A lot of people use air spray systems because they allow for more precision in detail work, especially on automotive and woodworking projects, but many of those models can be very pricey. However, some budget air spray guns are not suitable for that fine detailing. This model was actually made for detailing work, as it comes with an aluminum swivel cup that helps keep the paint flowing at an even pace while you rotate the gun to hit all those tight corners and odd angles. Being able to do fine work with an affordable tool is literally a dream come true. Another great feature of this model is that it’s designed to minimize spray waste, thanks to a stainless steel fluid needle and spray nozzle. Since these components are made of strong, solid metal, you can adjust it to achieve the desired fan size that’s perfect for your job. Being able to adjust the size and flow like that is key to being efficient, as using a fan that’s too wide means you’re just wasting paint, while a stream that’s too narrow requires you to make extra passes that can cause waste in the overlap of each pass. Larger commercial jobs or smaller jobs that happen with a high frequency call for a powerful paint sprayer that can stand up to that kind of demanding work. 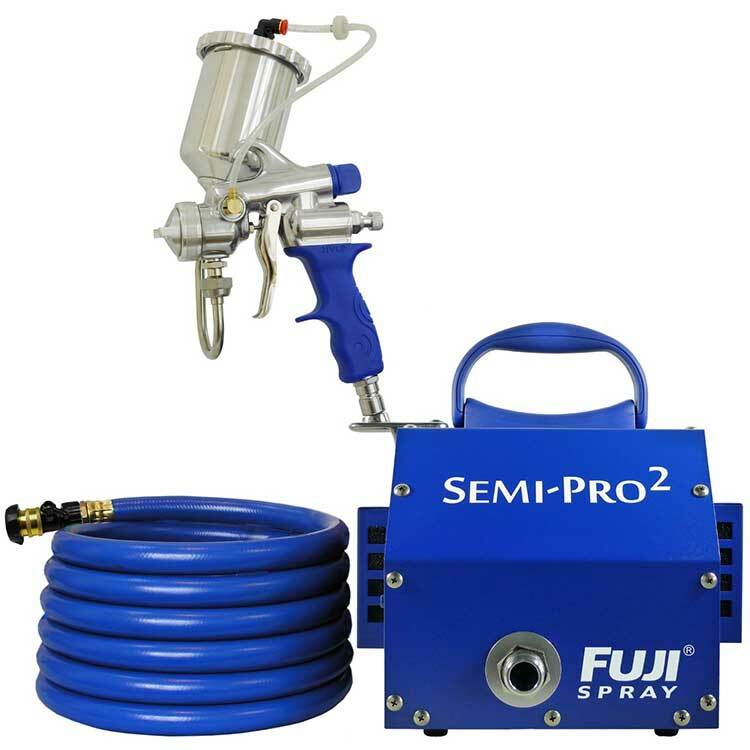 Of all the models I came across, this unit is definitely my choice for the best commercial paint sprayer system, since it combines a lot of powerful spraying force with great ease-of-use features to help you get the job done right. This model actually doesn’t require a separate air compressor to function, which you might think would be a big limitation when working on commercial projects. However, rather than using a small or subpar internal regulator, this sprayer features a compressor with a two-stage turbine for a huge power boost. Without getting into too much of the technical details, the system uses a more advanced and efficient engine that allows you to achieve a tremendous amount of power without requiring a serious additional machine or huge motor to do it all. Meaning, better spraying power with a smaller total size unit. 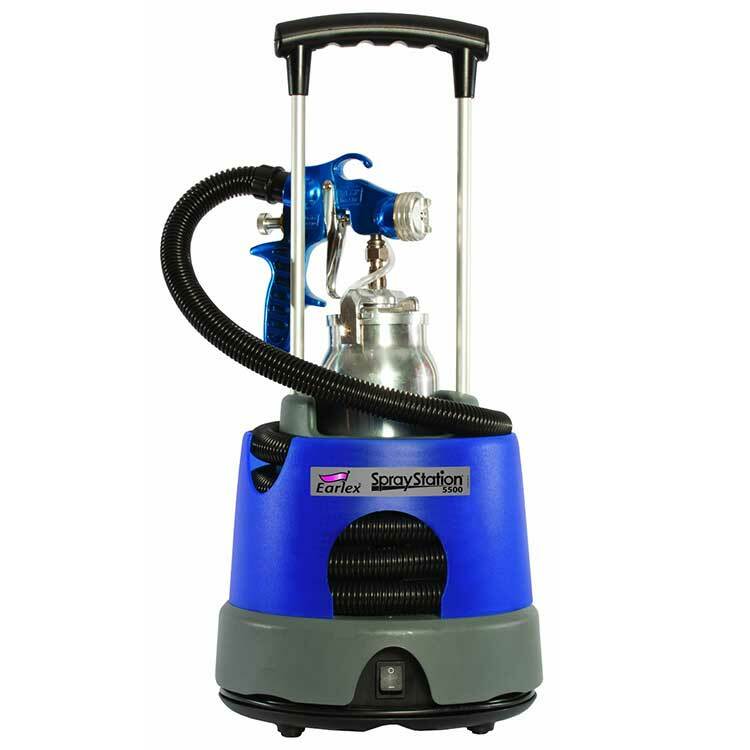 The two-stage turbine is only the start of the amazing commercial grade features present in this paint sprayer, all of which are designed for businesses that need to be as fast and as efficient as possible. First up, you’ve got a 25-foot spray hose, which means you can really move quite far with this unit in order to cover large rooms or the outside walls of buildings with ease. 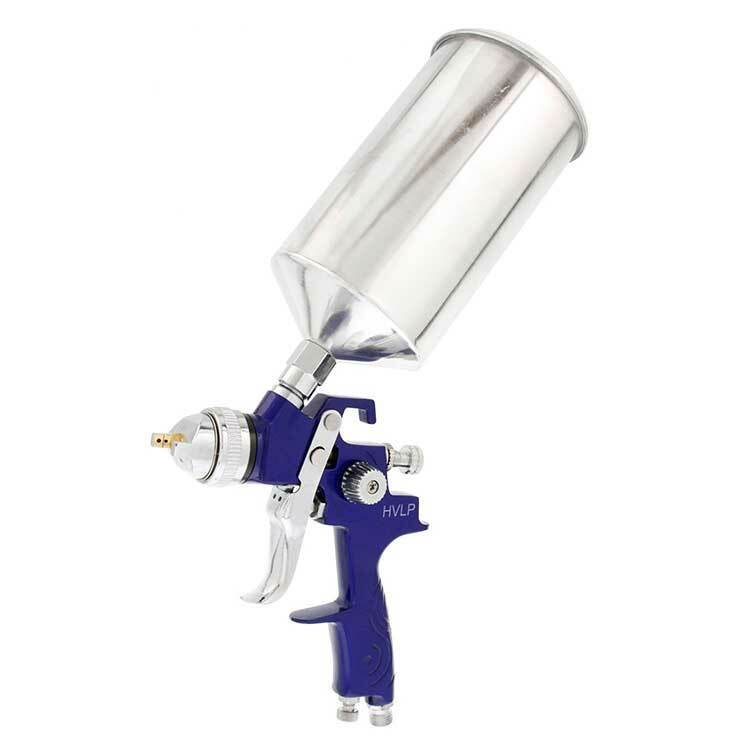 There’s also a non-bleed spray gun included, which will help you keep the paint focused on your spray area without any potentially harmful drips or spills. After checking out all of the models above, I truly hope that you were able to learn a thing or two about the wide world of paint sprayers. Whatever type of project you have in store, you should feel much more equipped to purchase a great sprayer that will help you do an amazing job. If you’re still not quite sure what paint sprayer you should chose, head over to the buying guide and other articles for more tips and advice on choosing between models. I’ve also got some longer reviews of the paint sprayers I thought were the true cream of the crop. Who knows, one of them might be the one you’ve been looking for.